Whereas ordinary diesel direct fuel-injection systems have to build up pressure anew for each and every injection cycle, the new common rail (line) engines maintain constant pressure regardless of the injection sequence. This pressure then remains permanently available throughout the fuel line. The engine's electronic timing regulates injection pressure according to engine speed and load. The electronic control unit (ECU) modifies injection pressure precisely and as needed, based on data obtained from sensors on the cam and crankshafts. In other words, compression and injection occur independently of each other. This technique allows fuel to be injected as needed, saving fuel and lowering emissions. More accurately measured and timed mixture spray in the combustion chamber significantly reducing unburned fuel gives CRDi the potential to meet future emission guidelines such as Euro V. CRDi engines are now being used in almost all Mercedes-Benz, Toyota, Hyundai, Ford and many other diesel automobiles. The common rail system prototype was developed in the late 1960s by Robert Huber of Switzerland and the technology further developed by Dr. Marco Ganser at the Swiss Federal Institute of Technology in Zurich, later of Ganser-Hydromag AG (est.1995) in Oberägeri. The first successful usage in a production vehicle began in Japan by the mid-1990s. Modern common rail systems, whilst working on the same principle, are governed by an engine control unit (ECU) which opens each injector electronically rather than mechanically. This was extensively prototyped in the 1990s with collaboration between Magneti Marelli, Centro Ricerche Fiat and Elasis. The first passenger car that used the common rail system was the 1997 model Alfa Romeo 156 2.4 JTD, and later on that same year Mercedes-Benz C 220 CDI. Common rail engines have been used in marine and locomotive applications for some time. The Cooper-Bessemer GN-8 (circa 1942) is an example of a hydraulically operated common rail diesel engine, also known as a modified common rail. Vickers used common rail systems in submarine engines circa 1916. Early engines had a pair of timing cams, one for ahead running and one for astern. Later engines had two injectors per cylinder, and the final series of constant-pressure turbocharged engines were fitted with four injectors per cylinder. This system was used for the injection of both diesel oil and heavy fuel oil (600cSt heated to a temperature of approximately 130 °C). The common rail system is suitable for all types of road cars with diesel engines, ranging from city cars such as the Fiat Nuova Panda to executive cars such as the Audi A6. Solenoid or piezoelectric valves make possible fine electronic control over the fuel injection time and quantity, and the higher pressure that the common rail technology makes available provides better fuel atomisation. In order to lower engine noise, the engine's electronic control unit can inject a small amount of diesel just before the main injection event ("pilot" injection), thus reducing its explosiveness and vibration, as well as optimizing injection timing and quantity for variations in fuel quality, cold starting and so on. Some advanced common rail fuel systems perform as many as five injections per stroke. • They were cam driven, and injection pressure was proportional to engine speed. This typically meant that the highest injection pressure could only be achieved at the highest engine speed and the maximum achievable injection pressure decreased as engine speed decreased. 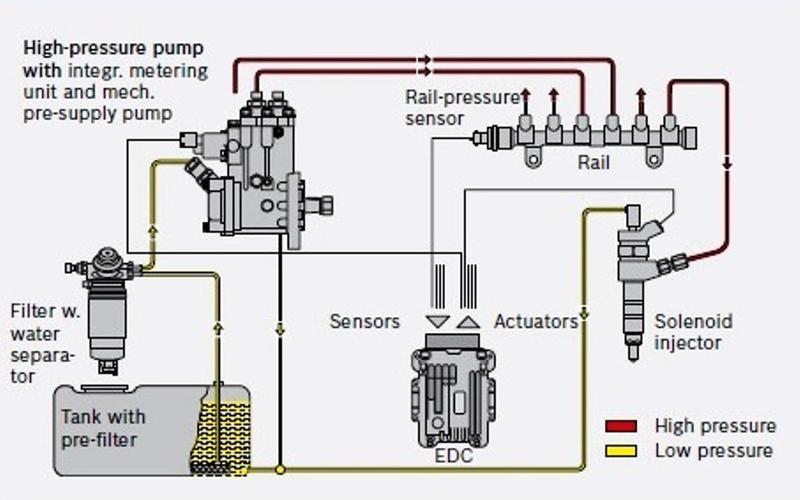 This relationship is true with all pumps, even those used on common rail systems; with the unit or distributor systems, however, the injection pressure is tied to the instantaneous pressure of a single pumping event with no accumulator, and thus the relationship is more prominent and troublesome. • They were limited in the number and timing of injection events that could be commanded during a single combustion event. While multiple injection events are possible with these older systems, it is much more difficult and costly to achieve. • For the typical distributor/inline system, the start of injection occurred at a pre-determined pressure (often referred to as: pop pressure) and ended at a pre-determined pressure. This characteristic resulted from "dummy" injectors in the cylinder head which opened and closed at pressures determined by the spring preload applied to the plunger in the injector. Once the pressure in the injector reached a pre-determined level, the plunger would lift and injection would start. In common rail systems, a high-pressure pump stores a reservoir of fuel at high pressure — up to and above 2,000 bars (psi). The term "common rail" refers to the fact that all of the fuel injectors are supplied by a common fuel rail which is nothing more than a pressure accumulator where the fuel is stored at high pressure. This accumulator supplies multiple fuel injectors with high-pressure fuel. This simplifies the purpose of the high-pressure pump in that it only has to maintain a commanded pressure at a target (either mechanically or electronically controlled). The fuel injectors are typically ECU-controlled. When the fuel injectors are electrically activated, a hydraulic valve (consisting of a nozzle and plunger) is mechanically or hydraulically opened and fuel is sprayed into the cylinders at the desired pressure. 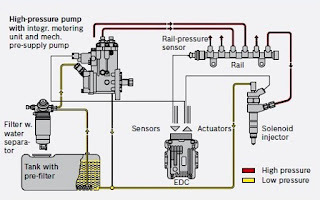 Since the fuel pressure energy is stored remotely and the injectors are electrically actuated, the injection pressure at the start and end of injection is very near the pressure in the accumulator (rail), thus producing a square injection rate. If the accumulator, pump and plumbing are sized properly, the injection pressure and rate will be the same for each of the multiple injection events. CRDi engines are advantageous in many ways. Cars fitted with this new engine technology are believed to deliver 25% more power and torque than the normal direct injection engine. It also offers superior pick up, lower levels of noise and vibration, higher mileage, lower emissions, lower fuel consumption, and improved performance. In India, diesel is cheaper than petrol and this fact adds to the credibility of the common rail direct injection system. Like all good things have a negative side, this engine also have few disadvantages. The key disadvantage of the CRDi engine is that it is costly than the conventional engine. The list also includes high degree of engine maintenance and costly spare parts. Also this technology can’t be employed to ordinary engines. The most common applications of common rail engines are marine and locomotive applications. Also, in the present day they are widely used in a variety of car models ranging from city cars to premium executive cars. Some of the Indian car manufacturers who have widely accepted the use of common rail diesel engine in their respective car models are the Hyundai Motors, Maruti Suzuki, Fiat, General Motors, Honda Motors, and the Skoda. In the list of luxury car manufacturers, the Mercedes-Benz and BMW have also adopted this advanced engine technology. All the car manufacturers have given their own unique names to the common CRDi engine system. However, most of the car manufacturers have started using the new engine concept and are appreciating the long term benefits of the same. The technology that has revolutionized the diesel engine market is now gaining prominence in the global car industry. CRDi technology revolutionized diesel engines and also petrol engines (by introduction of GDI technology). By introduction of CRDi a lot of advantages are obtained, some of them are, more power is developed, increased fuel efficiency, reduced noise, more stability, pollutants are reduced, particulates of exhaust are reduced, exhaust gas recirculation is enhanced, precise injection timing is obtained, pilot and post injection increase the combustion quality, more pulverization of fuel is obtained, very high injection pressure can be achieved, the powerful microcomputer make the whole system more perfect, it doubles the torque at lower engine speeds. The main disadvantage is that this technology increase the cost of the engine. Also this technology can’t be employed to ordinary engines. The manufacturers use custom acronyms to make their diesel CRDi product stand out in the competition.